Born in Emmental, Switzerland. Christoph Simon spent years travelling through the Middle East, Poland, South and North America and the UK, before settling back in his Swiss homeland. 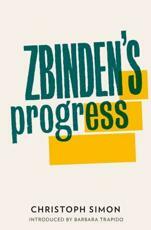 Although Zbinden’s Progress is his first novel to be translated into English, it is actually his fourth book, his previous works already establishing Simon as a household name in his native Switzerland. Lukas Zbinden leans on the arm of Kâzim, as they walk slowly down the stairway towards the door of his retirement home. Step by step, the irrepressible Lukas recounts the life he shared with his wife Emilie and his son. She loved to walk in the countryside; he loved towns and meeting strangers. Different in so many ways, what was the secret of their life-long love? And why is it now so hard for him to talk to his son? It is also the well deserved winner of the 2010 Bern Literature Prize. This is international literature at its finest! Buy from our independent bookshops during the festival, from BLACKWELL's using the link below, or find your preferred local book seller.